Recognize your most loyal supporters. 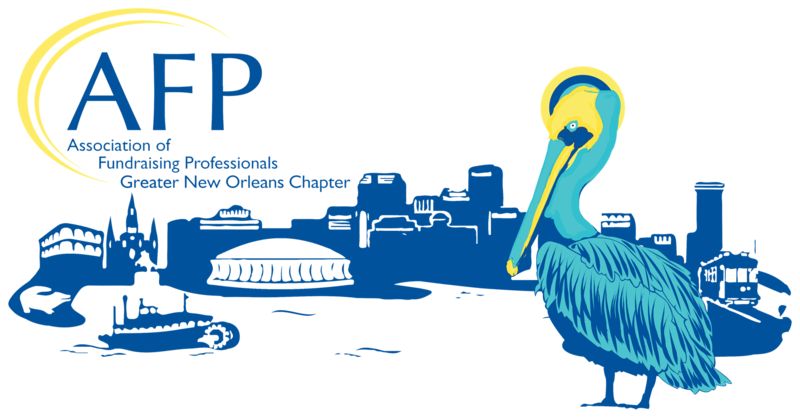 AFP Greater New Orleans Chapter will be honoring our community's most outstanding philanthropists, fundraisers and volunteers at our annual National Philanthropy Day Luncheon on November 7, 2019 at the Audubon Tea Room. Please consider taking this opportunity to recognize your most loyal supporters. Philanthropy Day can be a wonderful stewardship tool -- what better way to say thank you to your best donors, fundraisers and/or volunteers than with grand recognition and a heartfelt award from AFP-Greater New Orleans Chapter? The committee will not accept as complete any nomination that utilizes resumes, newspaper articles, annual reports, marketing materials or other such documents in substitution for concise responses to the criteria outlined below. Letters of recommendation are accepted, but only at the time of the original submission of the nomination. Please note that the Board of Directors, at their sole discretion, reserves the right to decline to issue an award in any particular category. Past recipients include: Charles W. Heim, Jr., FAHP, 1986; Charles E. Young, 1987; Patricia C. Mason, 1989; Charles J. DiGange, CFRE 1990; Elizabeth B. McCarthy, 1991; Clifford V. Johnson, CFRE, 1992; Julia Walker, 1994; Alex Comfort CFRE, 1995; Tom Harmeyer, CFRE, 1996; Michael Guillot 1997; Susan R. Mintz, 1998; Florence Andre, 1999; Margaret B. Epstein, 2001; Armand Bertin, 2002; Laurie Conkerton, 2003; Sharon Litwin, 2004; Carol G. McCall, 2005; J. Stanley Maher, 2006; Peter Quirk, 2008; Alice Wright, 2009; Beverly Lamb, 2010; Michael Bourg, 2011; Marilyn Dittmann, 2012; not awarded in 2013; Juli Smith Pattison, CFFRE, 2014; Marc Barnes, 2015; Susan Mancuso, CFRE, 2016; Roselle M. Ungar, CFRE, 2017; Sandy Levy, 2018. The individuals eligible for this nomination must have demonstrated exceptional leadership skills in coordinating groups of volunteers for one or more major fundraising projects, as well as commitment for the advancement of philanthropy in general. The narrative should specifically address your nominee's outstanding volunteer services as well as other civic responsibilities and accomplishments. Past recipients include: Diana M. Lewis and Katherine F. Duncan, 1986; Betty Lauricella, 1987; Melba and Moise Steeg, 1988; Harry J. Blumenthal, Jr., 1989, Joseph X Gemelli, Jr., 1990; Nancy M. Marsiglia, 1991; Ellen C. Brennan, 1992; Norman Kerth, 1993; Anne Milling, 1994; Frank Friedler, Jr., Mervin L Trail, M.D., 1995; Georgia M, Simmons, 1996; Liz Sloss, 1997; Michael 0. Read, 1998; Suzanne Rusovich, 1999: Kim Sport, 2000; Patricia Couere Denechaud, 2001; Mary Jane W. Becker, 2002; Helen Nalty Butcher and Elizabeth Nalty Smither, 2003; Ashton Ryan, 2004; Susan R. Johnson, 2005; M. Cleland Powell, 2006; Dr. Donald Faust, 2007; Joseph S. Exnicios, 2008; Clark Todd, 2009; Mary Ann Valentino, 2010; Richard Treuting, 2011; Susan Lane Stall, 2012; Lizette Terral, 2013; Barbara Turner Windhorst, 2014; Fred H. Myers, 2015; Michael Hollis, 2016; Karen Saunders DeBlieux, 2017; Robert Bories and Daniel Conwill, 2018. Past recipients include: Freeport-McMoRan, Inc., 1986; CNG Producing Company, 1987; Shell Offshore, Inc., 1988: Chevron, USA, 1989; Hibernia National Bank. 1990; Radiofone, Inc., 1991; Stewart Enterprises, Inc., 1992; L.P.&L./NOPSI & Entergy Corporation, 1993; L L & E, 1994; Plaza Shopping Center, 1995; Kentwood Spring Water Company, 1996; The Times-Picayune, 1997; The Whitney National Bank, 1998; BellSouth Corporation, 1999; Liberty Bank and Trust Co., 2000; Bank One, 2001; Latter & Blum Inc. Realtors, 2002; ChevronTexaco, 2003; Hibernia National Bank, 2004; Adams and Reese LLP, 2005; Lockheed Martin Space Systems, 2006; Shell Exploration & Production Company, 2007; The New Orleans Saints, 2008; Ochsner Health Systems, 2009; Cox Communications, 2010; Dow Chemical, 2011; First NBC Bank, 2012; Peoples Health, 2013; Acme Oyster House, 2014; Chevron Gulf of Mexico Business Unit, 2015; Phillips 66, 2016; United Healthcare Community Plan of Louisiana, 2017, Capital One, 2018. Past recipient: Libby-Dufour Fund, 2003; J. Edgar Monroe Foundation, 2004; A8C26/WB38 Children First Fund of the McCormick Tribune Foundation; Collins C. Diboll Private Foundation, 2006; Zemurray Foundation, 2007; The Greater New Orleans Foundation, 2008; The Catholic Foundation, 2009; Baptist Community Ministries, 2010; Joe W. and Dorothy Dorsett Brown Foundation, 2011; Louisiana Hospitality Foundation, 2012; The Joan Mitchell Foundation, 2013; Azby Fund, 2014; Methodist Health System Foundation, 2015; Oscar J. Tolmas Charitable Trust, 2016; The Feil Family Foundation, 2017, Hogs for the Cause, 2018. Past recipients include: Joseph A. Childress, 1985; Adelaide W. Benjamin, 1986; William B. Burkenroad, 1987; Phyllis and Patrick Taylor, 1989: Mr. and Mrs. Charles Keller, Jr., 1990; John Bricker, 1991; Ella West Freeman Foundation and RosaMary Foundation, 1992; Jack R. Aron, 1993; Mrs. Roger Stone, 1994; Darwin and Mary Jane Fenner Family Fund, 1995; The Joe W. and Dorothy Dorsett Brown Foundation, 1996; C. Allen Favrot, 1997; Edward Wisner Foundation, 1998; Jerome L. Goldman, 1999; Gary N. Solomon, Sr., 2000: Eugenic and Joseph Jones Family Foundation, 2001; William Goldring, 2002; Jeri Nims, 2003; David Voelker, 2004, Walda and Sydney Besthoff, 2005; Anne Gauthier and Daughters, Celeste, Cherie and Michelle, 2006; Mr. & Mrs. H. Mortimer Favrot, Jr., 2007; Shirley K. Haspel, 2008; Roger Ogden, 2009; Carol Wise, 2010; Stephen Stumpf, 2011; J. Kerry Clayton and Paige Royer, 2012; Tom and Gayle Benson, 2013; Joan Heymann-Bergmann, 2014; David Fennelly, 2015; Joyce Pulitzer, 2016; Joy & Boysie Bollinger, 2017; Frank & Paulette Stewart, 2018. Past recipients include: Robert Wood Johnson Foundation, 1989; The Kresge Foundation, 1990; Freeport-McMoRan, Inc., 1992; The Nalco Foundation, 1993; The Greater New Orleans Foundation, 1995; Archbishop Philip M. Hannan, 1997; Stephen W. Hales, M.D., 1998; Ecetra Anderson Nippert, 1999; The Entergy Corporation, 2000; Fore!Kids Foundation, 2002; Gheens Foundation, 2004; Jewish Endowment Foundation, 2005; Junior League of New Orleans, 2006; Baptist Crossroads Foundation, 2007; Fleur de Lis Ambassadors, 2008; Leslie Jacobs, 2009; Lake Pontchartrain Basin Foundation, 2010; The Blood Center, 2011; not awarded in 2012; Robert Merrick, 2013; James E. Fitzmorris, Jr., 2014; Emerging Philanthropists of New Orleans, 2015; Ashton Ryan, Jr., 2016; The Helis Foundation, 2017; Volunteers of America/Jim LeBlanc, 2018. This award was created in 2007 to identify and encourage young people who have demonstrated outstanding philanthropic service to our community. This award recognizes service by an individual or group of students (ages 10-23 years old) who demonstrate outstanding commitment to the community through direct fundraising support, development of charitable programs, volunteering and leadership in philanthropy. The recipient will receive a $250 grant to donate to the charity of his/her choice. Past recipients include: Stanford Rosenthal, 2007; Madeline Baay, 2008; Manya-Jean Gitter, 2009; not awarded in 2010; Kayla Allain and Charlotte Langenstein, 2011; not awarded in 2012; Princeton Carter, 2013; not awarded in 2014; Victoria King, 2015; not awarded in 2016; Mignon Blanc, 2017; Amanda Rougee and Isabella& Hannah Summersgill, 2018.